The area that is governed by Coventry City Council is made up of 18 areas (called 'wards'). Each ward is represented in Coventry City Council by three Councillors. There are three elections in every four years. Each ward elects one of their Councillors in each election (and then there is one year where no elections take place). Elections usually happen in May but you need to register to vote beforehand. The people who are elected are called Councillors or Elected Members. The Council Meeting is the ultimate decision making body and the principle forum for major political debate. Together the 54 elected Councillors make up Full Council. Full Council meets every six weeks. They are public meetings (there may be some private items of business), which you can attend or view as a live or archived webcast. The party with the most elected Councillors nominates one of their Councillors to be the Leader of the party. At the Council's annual general meeting (AGM) the Full Council votes to elect them to become the Leader of the Council. The Leader is the political face of the Council and does other duties as well as representing their ward. The Cabinet is made up of the Leader and nine other Councillors (usually from the same political party). The Cabinet has public meetings every month (they may contain some items of private business) and makes recommendations to the Full Council. Cabinet members are the people who are in the Cabinet. They each have a 'portfolio' of services that they are responsible for and they have their own meetings to discuss their specific responsibilities. The Lord Mayor is one of the Councillors and they are chosen each year by the Full Council. It is a non-political role, they chair the Council meetings, promote the city and perform ceremonial duties. The people who work for the Council (non-political employees) are sometimes called 'officers'. They research and implement the policies that are decided by the Councillors. The Chief Executive is the head of the officers. The Chief Executive is responsible for implementing the Council's policies. the law requires the Council to decide on (e.g. setting the Council Tax). will cost the Council up to £1million. will cost the Council up to £500k. 4. Delegated decisions are when an officer can make the decision. These are day-to-day decisions. The scrutiny boards hold the decision makers to account. They review decisions and services, and can influence future decisions. 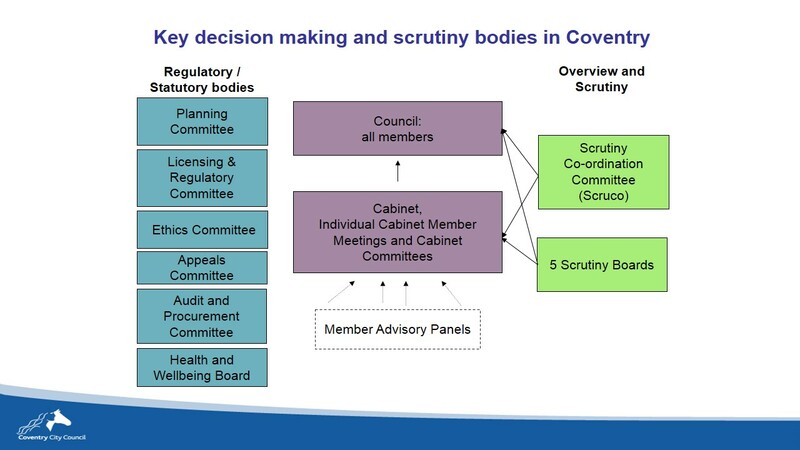 There are five scrutiny boards; each with a different area of responsibility. There is also a Scrutiny Co-ordination Committee, which oversees the scrutiny boards and deals with the Leader and Deputy Leader's portfolios. The scrutiny boards are made up of a number of Councillors (who are not in the Cabinet). Scrutiny chairs are usually from the ruling party.